When I think about the important things in a homeschool curriculum (especially ones that begin with T!) one of the first that comes to mind is Teachable Moments. 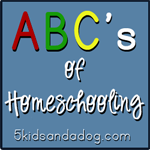 When we began our homeschool journey I read up on how to go about homeschooling, the different methods, and what others did. I often saw parents exhort homeschoolers to utilize teachable moments. I know they referred to academic impromptu opportunities. But God put something else on my heart. He showed me how every situation my children and I encountered had a Bible passage to coincide and I needed to be ready (in season and out) to facilitate His lessons. Ever since they were little I have tried to counter all elements of life with God's word. Disobedience or a difficult situation often found us in scripture asking, "What would Jesus do?". Celebratory moments were used as an opportunity to remind them of Who deserves the glory and gratitude. The Teachable Moments I look for first are not usually textbook, they are Good Book. They are pertinent and important and the key to raising self-confident, well grounded kiddos. It is the supreme example of cause and effect with the ultimate reward chart being tallied in Heaven. To have God's love and grace intertwined with the very soul of ourselves is the greatest gift we can help God give our children. Teachable Moments in the Truth of His Word are the lessons that will last a lifetime. When the sun sets and algebra equations are long forgotten, prepositions have retired, and the order of presidents has become muddled... His love and truth will still be nestled perfectly safe in their hearts. His wind will fill their sails and His lessons are somehow never forgotten. Don't miss those Teachable Moments in His Truth... you can't get them back! Like all moments in life; they are fleeting and only livable in the moment! May God bless you with teachable moments in abundance that you and your family may live His glory every day. This is very true! The ability to bring God's Word into the "teachable moments" is the very reason that many homeschool. Naomi, yes it is, and praise Him that we can! Blessings to you today!